My boyfriend and I decided to drive to Maginhawa after cleaning his room. It’s been ages since our last food trip there. But when we got to the famous food strip, most of the eateries that were usually open until 2 AM were already closed; yet it was just 12:30 AM at the time. Nonetheless, I kept driving. 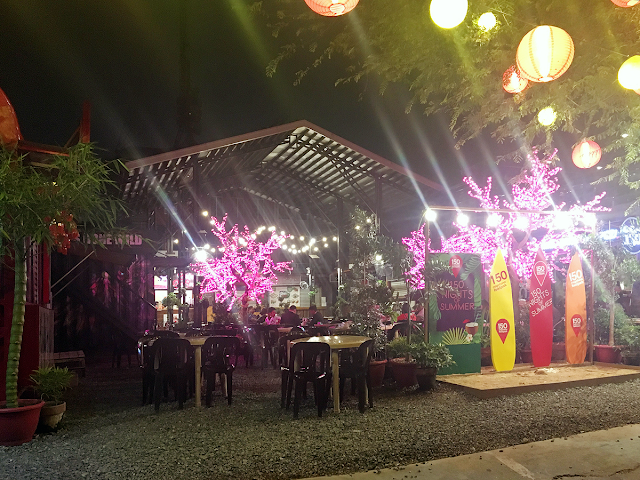 And it wasn't long until a bright and festive place came into view: 150 Maginhawa Food Park. 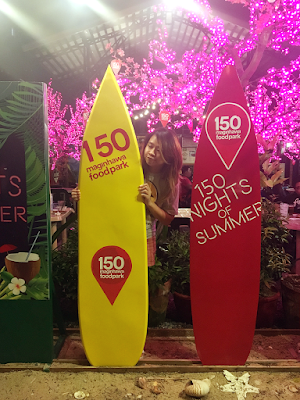 The food park was an open-air, dining space that was adorned with Chinese lanterns, Cherry Blossom trees and surfboards. You can actually take pictures while you choose from the various food stalls in the area. Now, we didn't order from all of them. But we made sure to check some of the stores menus. Everything on the menu looked tasty. Even the aroma that was coming from the kitchen tickled my nose. Although we didn't order from SOS, I found the Suon Ram Man (Caramelized Pork Spare Ribs) and the Pho noodles worth trying on our next visit. FUN FACT: Pho means Vietnamese noodle soup. For someone who loves desserts, SAM'S was a heavenly treat! I was about to order their Vanilla Caramel Shake when they announced that they were already closing for the night. *CRIES* Nonetheless, I'm making it my mission to try their concoctions real soon. Wings Gone Wild has a very interesting menu, which consisted of sausages, fries, and Buffalo Wings slathered with a selection of flavors (the spicy variation is the best!). Guess what? They even have Buffalo Chicken Skin on the list. Yum! If you're carving for some Mexican food, then this place is for you. My boyfriend's sister, Ms. Budget Biyahera herself, has already eaten here countless times. And her favorites are the Burritos, Tacos, Quesadilla, Nachos and Fries. Also, Molcajete sells a Spinach & Artichoke dip, which I am curious to try next time. FUN FACT: Molcajete means mortar and pestle. If you're craving for some grilled ribs, then you'll definitely find it at Sticky Pig. They even offer pasta variations to suit their customers preference. Surprisingly, they had seafood on the menu (despite the name) like Breaded Fish Fillet and Spicy Garlic Buttered Shrimp. 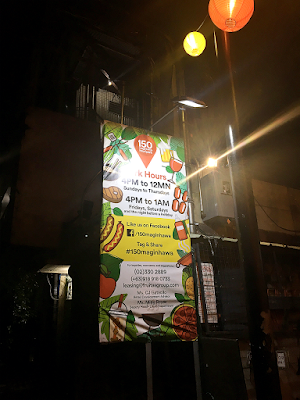 Balay Bagnet offers comfort food that's inspired by a few famous dishes in Ilocos. And while they offer rice meals, they also have the Barkada meals, which is a good option when dining as a group. This Canadian-inspired food stall makes their own Donairs, which is a Turkish Kebab that consists of fried pita with spicy shredded beef -- one of Canada’s delicacy. They even have the "Poutine" dish served in different forms, ranging from a Classic to a Maple Bacon Poutine (their bestseller). The Piggery, as the name implies, offers nothing but pork food options that are served with Asian, American, and Filipino flavors. They also offer cold refreshments like the Little Milo Dinosaur (an ice cold drink made of milo), and Calamansi juice in big glass containers. 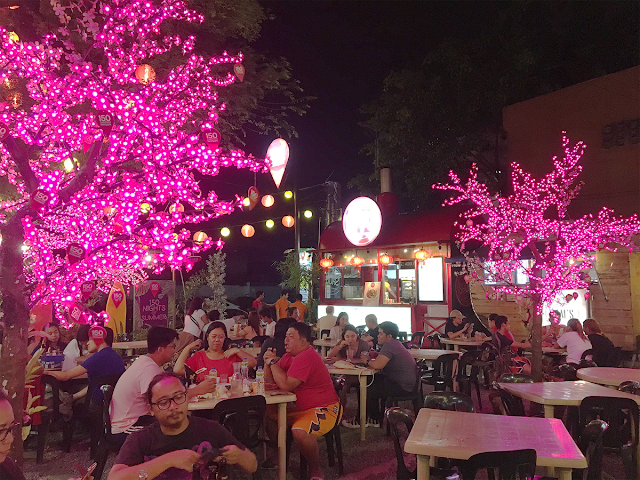 Xurreria Cafe is a dessert place that is known for their delicious Churros (spelled "xurros" to complement the cafe's name)! They even offer different types like the Classic, Sticky, Glazed, Filled and Ala Mode Xurros. And if you're looking for something hot to pair with this fried dough pastry, Xurreria also serves coffee and Frappuccino. 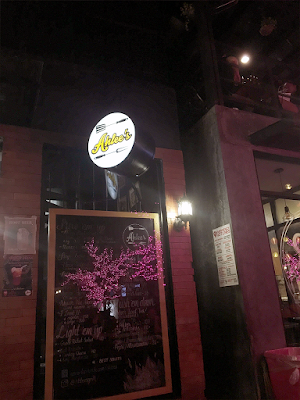 If you're looking for a juicy and mouthwatering steak, then Ahlee’s is the place! My boyfriend kept telling me that he's been craving it for the longest time. So it was definitely a great find. To be honest, I was already preparing myself to be disappointed with the taste and texture, given the cheap price and location (it wasn't served in a regular restaurant setup). But we still gave it a try. We ordered two big Porterhouse Steaks (with a side of Baked Potatoes or rice), which we requested to be cooked medium rare. Two different types of sauces where also offered to us: the Red Wine and Gravy (with free refills), which we both ordered so that we could taste each one. Of course, for refreshments, we tried their House Blend Iced Tea, which was priced at P100/1L. Porterhouse Steak: Big (P260) / Extra Large (P280). Prime Ribs: Small (P400) / Medium (P500)/ Large (P600). Other varieties also include Chicken, Lamb, Kofta Balls and Shaun d’ Sheep (kebab type), which comes with pita bread. As soon as our orders came, we noticed that the rice was smoky, and the steaks looked pale. But putting our doubts aside, we started to dig into our meal, and we were immediately impressed! The meat was so tender, that we no longer needed a knife to cut through it (except for the tendon part). Now, I dipped my medium rare steak in the gravy first, and found the flavors quite explosive. It wasn't salty or greasy, and was really well seasoned. I satisfingly chewed on my Porterhouse, which for me had the perfect texture. I tried the red wine sauce next, which was served hot. The richness of the fermented grape juice immediately engulfed the steak, which gave it a more authentic flavor at every bite. My boyfriend was so impressed with the Porterhouse, that it made him beam with delightfulness. This was actually a great thing since he's always been very picky with his food. 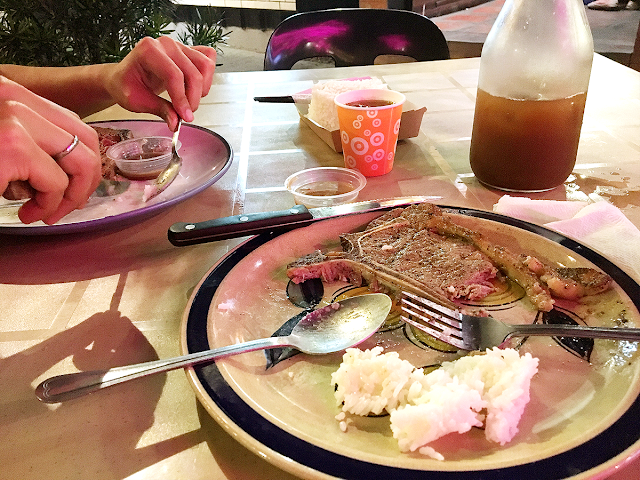 But Ahlee's Porterhouse was so good, that he ordered another plate of rice. I mean, the steaks really lived up to its name, and to the server’s word (I thanked her and praised the food), as it exceeded our expectations. 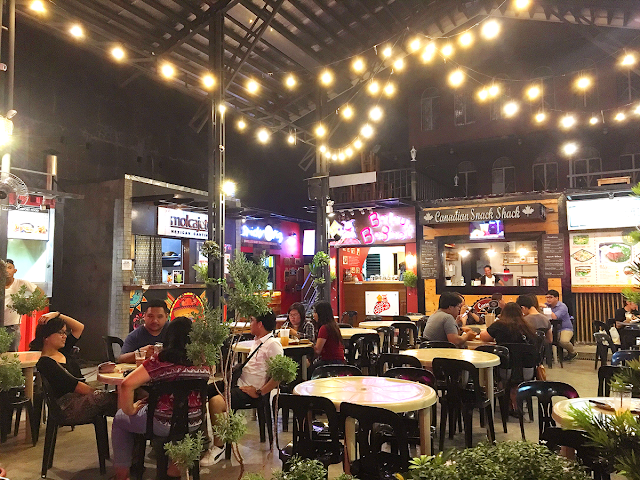 Whenever you feel like eating at Maginhawa, do visit Ahlee’s at 150 Maginhawa Food Park. Their steaks are quite delicious and affordable.